The worst sound in a refugee camp is silence. The silence means that babies are so malnourished that they no longer have the energy to cry. A vast silence has spread across South Sudan where famine was first declared in February. 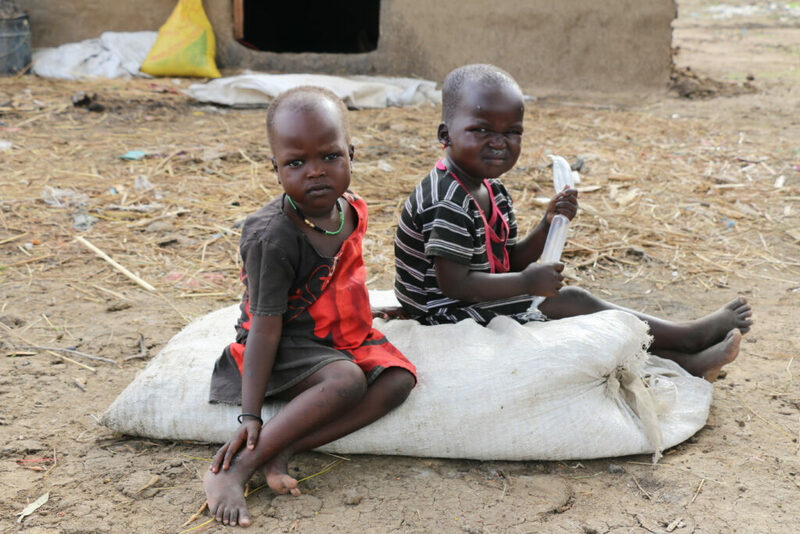 At least 100,000 South Sudanese are facing famine today, and one million more are desperately close. This silence is disrupted only by the regular cacophony of violence. Just days ago, three South Sudanese workers contracted by the World Food Programme (WFP) were murdered while trying to bring food to those suffering in their own country. The civil war in South Sudan — the world’s youngest country — has taken the lives of hundreds of thousands of people just like Daniel, Ecsa and Ali. Millions have been displaced by war, some within the country hiding out in swamplands and others crossing the border to Uganda and Ethiopia and other neighboring countries. In doing so, they join the ranks of the 65.3 million people globally who have been forced from their homes by violence, conflict and persecution. It wasn’t a historic drought that devastated South Sudan’s food supply. This famine is entirely man-made, driven by conflict that disrupts food production and humanitarian access. In addition to South Sudan, the international community may be forced to declare famine in northeast Nigeria, Yemen, and Somalia — each experiencing some degree of violent conflict themselves, the common thread across most humanitarian crises today. All told, 20 million people in these four countries are at elevated risk of starvation. We do not use the word famine lightly. The term means more than severe and widespread hunger: it is clearly defined, and formally declared by an international body through a system known as the Integrated Phase Classification (IPC). To reach IPC Level 5, or famine, at least 20 percent of households in a defined area must be experiencing severe food shortages; more than 30 percent of the affected population must be facing acute malnourishment, and at least two adults or four children per 10,000 people must have died from hunger. By its very definition, when famine is declared people have already died from starvation. These deaths are entirely preventable. Given the modern tools we have to assess food security conditions anywhere in the world, we often know many months in advance when famine is likely to occur. The last famine was formally declared in Somalia in 2011. From August 2010 to June 2011, the year before famine was declared, 78 communications regarding the deteriorating food security situation in country were released, and over 50 briefings with donors, humanitarian agencies and the media were conducted. Yet early warning never translated into early action, leading to the death of over 250,000 people. This scenario is playing out again in 2017, where the IPC has warned of looming famine in South Sudan since 2014. Yes, wars need to be prevented and resolved, and the international community must exert political pressure to ensure that full humanitarian access in these settings is achieved. After all, man-made crises have man-made solutions. As we work to achieve this goal, we cannot, and we must not, allow people to starve. Heroic workers selflessly serve on behalf of all of us, facing not just the risk of violence, but other hurdles like an approaching rainy seasons that will destroy inland road access. The one thing that should never prevent them from carrying out their task is a lack of resources. When a famine occurs, the international community collectively vows, “never again.” Yet six years after the last declaration, we face the threat of multiple famines — and today the stakes are even higher and the potential loss of life greater. The United Nations needs $4.4 billion to meet the humanitarian needs in these four countries. WFP requires around $1 billion for food assistance alone through September of this year. As of last week, the organization had received just over 20 percent of the funding it needs. In a world of surplus food and of great wealth, it is wholly unacceptable to deny food to a starving baby, especially when relief workers are in place but empty-handed. America can be proud of the long-standing bipartisan tradition of leadership from both Congress and administrations over the years in the fight to alleviate global hunger. It is time, again, to step up and lead the international community in responding to the unprecedented human suffering before us today. The four famines represent an opportunity to demonstrate global leadership and to rally the international community behind us. Doing so is wholly consistent with American values and traditions, representing the best of who we are as a nation. As we write this, congressional leaders in both the House and Senate, Democrats and Republicans, are working to mobilize additional resources for these four looming famines in the omnibus appropriations bill that will fund government operations as of April 28. We urge other members of Congress to join their colleagues in supporting this effort. This date coincides with another important milestone for the United States: the end of President Trump’s first 100 days in office. Rarely is a U.S. leader presented with an opportunity to define his presidential legacy so early in his term. The president can back Congress’s current effort to address the famine and engage other heads of state to ensure they too provide their share of this global responsibility. At a time when the world is consumed with so many issues that divide us, a global effort to respond to famine can unite all people. It is a call to action and an opportunity that must not be missed. The last thing humanity can afford in the face of famine is more silence. *Rick Leach is the president and CEO of World Food Program USA. *Bob Dole is a former senator from Kansas, set a record as the nation’s longest-serving Republican leader. He is a founding board member of World Food Program USA. He is on Twitter at @SenatorDole.